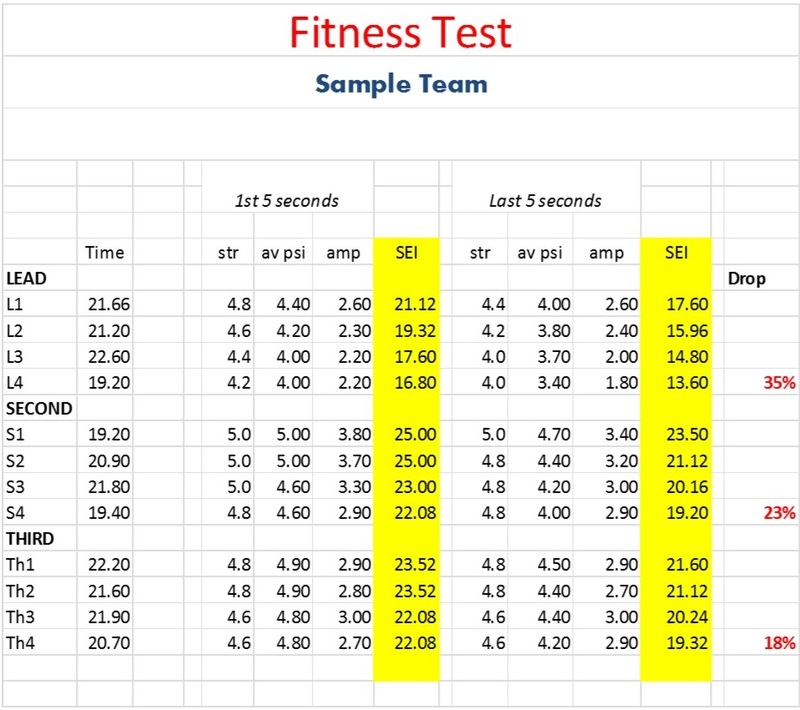 The following is a sample of the kind of report we give to teams when we analyze their sweeping using the sensor brush. All testing data are confidential, we never tell anyone other than the team members what their results are. The numbers in this sample are rough averages taken from very good men’s curling teams. They are representative of the results we get. The comments are representative of the kinds of feedback we have provided. The report above depicts the relative sweeping effectiveness of three members of a curling team. The report below depicts the effects of fatigue on that team’s sweeping effectiveness. Lead: The lead sweeps from both sides. His number of strokes per second is about average. He is slightly stronger on the left hand side of the rock than the right side. This difference shows up in the last 5 seconds more than the first 5, and more on hits than on draws. Amplitude (the difference in pressure on the push stroke and the pull stroke is normal). Examination of the strip chart showed something strange: on every fifth stroke the pressure exerted on the brush dropped significantly. Examination of the video accompanying the strip chart showed that this is due to a flaw in this sweeper’s footwork. Every time he switches his feet (every fifth stroke) he loses his balance just a bit, but enough to reduce the pressure on this stroke by up to 40%. This sweeper could benefit by training and practice on his footwork. The percentage of efficiency lost from the beginning to end of each shot is about average. Second: The second sweeps from the left side only. We tested him sweeping with a slider on the front foot (s) and when wearing 2 grippers (g). Overall the second is a stronger sweeper than the lead, so should be sweeping closest to the rock when they sweep together. Sweeping with 2 grippers produced significantly greater efficiency than sweeping with a slider, an improvement that averaged about 16%. This is consistent with our testing of other teams. Amplitude for this sweeper is greater than it is for the other sweepers, and high compared to other teams. This means that the pressure exerted on the pull stroke is significantly less than the pressure exerted on the push stroke. Training in proper technique would benefit this sweeper. I should note that a large amplitude is often due to the player sweeping too broad a path. The running edge of a rock is only about 5” in diameter. Examination of the video showed that this player was sweeping a path of about 12”, wasting strength and energy. Third: The third sweeps from the right side only. On the first 2 trials this player showed the smallest scores on the sweeping efficiency index. His strokes per second was fine, but his pressure was low. We worked on his technique and then redid the sweeping test using a technique that allowed him to exert pressure down the length of the brush shaft. This involved changing his hand position and posture. The increase in efficiency with the new technique was immediate and significant (an average increase of greater than 30%). Each player swept 4 draws from hog line to t line, with a one minute rest in between draws. The second used 2 grippers. The third used the new technique we worked on. Comparing the sweeping efficiency from the last 5 seconds of the fourth draw to the first 5 seconds of the first draw: The lead showed the greatest drop in efficiency (35%, a drop that is higher than the average elite player). The second showed a moderate drop in efficiency (23%), and the third showed the lowest drop (18%). I recommend a combination of fitness training and training in efficient sweeping technique, especially for the lead, then retesting to assess progress. Please improve on your data, like in pull force and push force of sweeping. 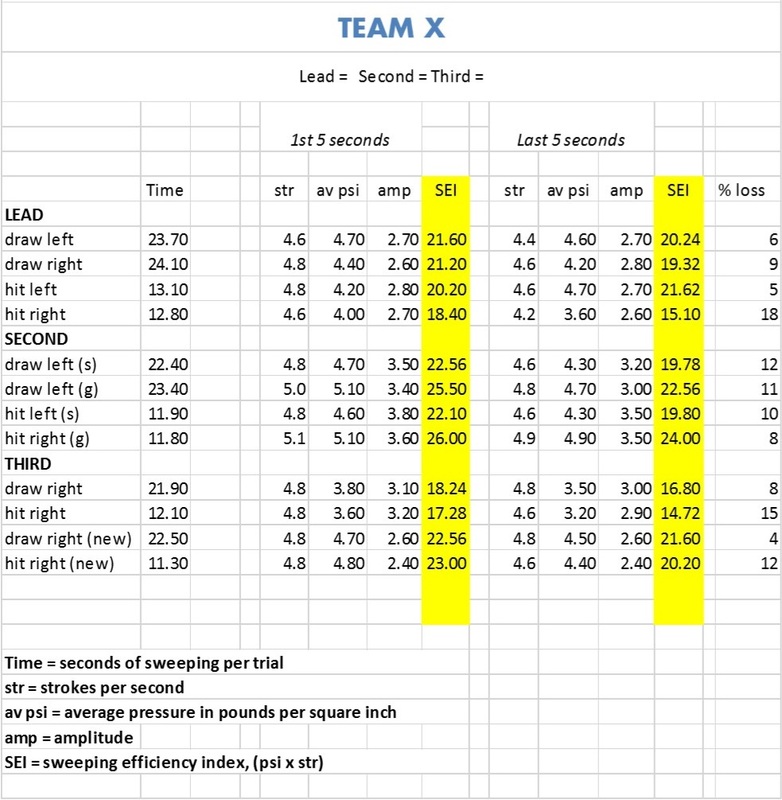 For the first draw swept by the second (the first 5 seconds) average psi = 4.70. The amplitude is 3.50. So the average maximum is 6.45 (4.70 + 1.75) and the average minimum is 2.95 (4.70 – 1.75). Note that the minimum pressure is less than half the maximum. Our system has simultaneous video capture, examination of which led us to suggest that the large drop in pressure from push to pull stroke was due in part to the player sweeping too broad a path.